For our last holiday Pierateer ALE and I decided to spend a few weeks in Malaysian Borneo. Before I left I was slightly apprehensive about how I would fare. 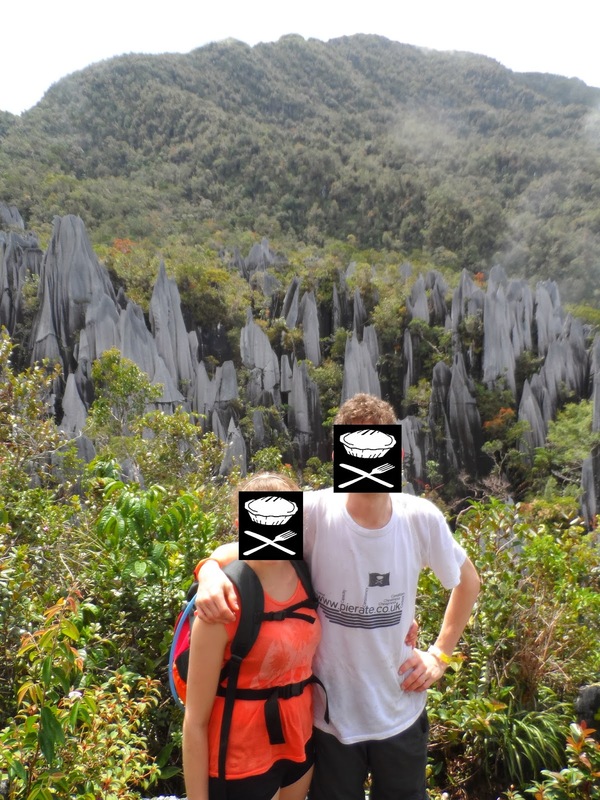 Pierateer TJP had previously spent some time in Borneo and encountered no pies. I was aghast at the thought of spending three weeks without eating any pies. So how did I get on? Well the typical food doesn't involve pastry in any way. Rice and noodles are the staple foods with the fried varieties being particularly good. Malaysian curry was something I hadn't tried before but I came away with quite a taste for it. The omnipresent Laksa soup was also worth tasting but could be quite spicy. My favourite local food was Rendang, a rich, slow cooked beef curry. However, none of these culinary delights ticked the boxes that a pie does. There is a fulfilment that a pie can give and noodles don't even come close. Hence I was pleased to discover pie almost at the very start of my trip. 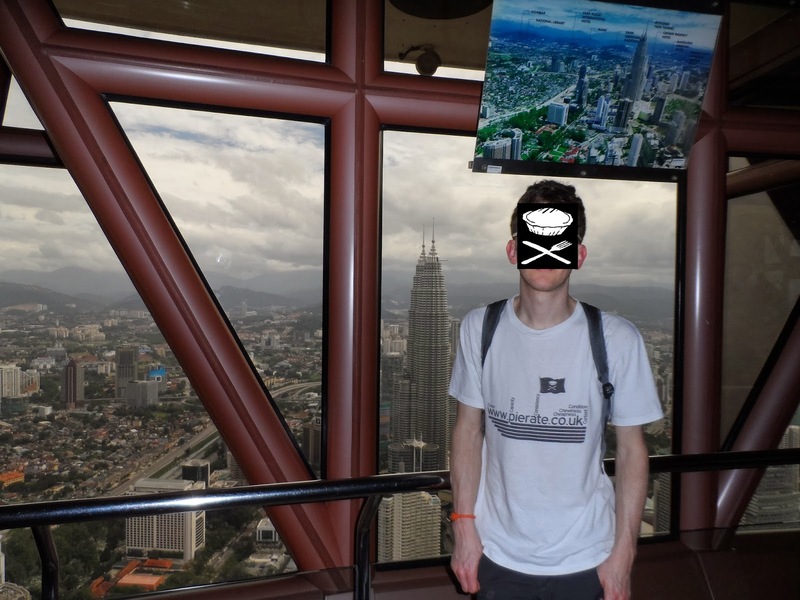 The trip commenced with a stop over in Kuala Lumpar, a brash clod-hopper of a city on mainland Malaysia. The heaving old parts of the city mix side by side with the gleaming modernity of the new city built by oil dollars (or oil Ringgits when in Malaysia). The iconic Petronas towers highlight how much Malaysia has developed from oil money. The photo below shows the view of the Petronas towers from the nearby KL radio Tower. We didn’t much like KL for a stop over though, it is hot and congested and it is pretty much not possible to walk even the shortest distances due to lack of pavements. It is certainly not designed for pedestrians. Then we got a flight over to Kuching, the largest city in the Malay state of Sarawak on the island of Borneo. This place was a lot mellower with a lovely waterfront promenade. Actually, probably more mellow than normal because a lot of the shops were closed due to the Chinese New Year. The only places that were open were the very western shopping malls that Kuching had. Despite not feeling very authentically Malaysian this did lead to an opportunity for pie. I was amazed to discover the Kuching Starbucks actually stocked a couple of types of pie! (Despite their British outlets never selling our favourite pastry product.) I was quite excited to see both Beef and Onion Pie and a Curry Pie in the chiller cabinet and promptly got in the queue. I was keen to get the curry pie as I thought it might be more Asian in taste. Unfortunately there was a little girl behind me in the queue who told her Dad she really wanted a curry pie…. And there was only one left…. I just had to go with the beef and onion! For some reason Starbucks in Borneo sell pies! The pie came well presented on a plate although it had a strange vent hole which had made some of the gravy congeal. Sadly this pie was a bit of a disappointment to eat, there was a lot of pastry and it was a bit dry. This was not like the pastry on a British pie, it was more like Chinese pastry. The filling however was surprisingly similar to that found in a beef and onion pie at home and wasn’t bad and had plenty of gravy. This shows that meat pies are loved all around the world! Unfortunately there was also a piece of foil embedded in the pastry which didn’t inspire me to think that this pie was top quality! I can't quite remember the price but at the time I scored it only 3 out of 7 for cheapness. Starbucks prices were very expensive by Bornean standards. It wasn't a great pie for the price but one I would perhaps have bought again because there were no alternatives! After spending time in Kuching we headed to Bako national park and stayed there a night. This was in a beautiful setting by the beach. Here we saw plenty of monkeys including the Proboscis monkey with it’s incredible nose. The night walk was not to be missed with glow in the dark scorpions and a fantastic display by the fireflies. After Bako we went to Semongoko Orangutan Sanctuary and were lucky enough to see a large number of Orangutans. Heading north we spent time in a traditional longhouse on a homestay before taking a short flight into Mulu National Park. For me the caves in Mulu park were one of the highlights of the trip, especially Deer Cave with it’s huge entrance and the idealic Garden of Eden. The rooves of the caves were covered in bats which produced unbelievable quantities of poo, making the floor a sea of insects in some places. Enough to put you off eating pie! Treking on from there we got to the most challenging part of the trip, The Pinnacles. This impressive, spikey rock formation is worth seeing, but is hard to get to. The trail to the Pinnacles viewing point is only 2.4 km long but it rises 1,200m and the last section is near vertical with ropes and ladders to climb. The chances of rain are high which make it slippery. Heading north to Limpang via the Headhunter’s Trail we took a ferry to Kota Kinnabalu. We stayed just outside of town and for one dinner headed to the nearby Langkah Syabas hotel where I was lucky enough to see another pie on the menu, although not really local cusine. The hotel is owned by an Australian so this was a traditional Aussie Meat Pie for 25 Ringgits (close to £5!). It was a good pie, however, at this price, which was very high for Borneo, it didn’t really do enough to impress. It was also a bit disconcerting for the menu not to tell me what the meat was. I will admit it was presented well and the pastry was nice and soft and slipped down easily. The filling was meaty without being exciting. I haven't tried pies in Australia but this wasn't as good as Aussie style pies I have had in the UK. See our article on Aussie pies. Sadly the trip didn’t contain any more pie adventures. We just headed to the Tip of Borneo to Howard Stanton’s Tampat Do Aman eco-camp. It was very basic (compost toilets! ), with some traditionally constructed long houses but this was a lovely place to relax. Howard is a British ex-pat who is only too happy to help sorting out trips and activities for you. There are beaches not too far away and Howard has a restaurant called Tip Top on one of the beaches. There are plenty of idealic coves to explore and you are certain to be able to find one to yourself as the Tip of Borneo still seems to be a bit of a secret. The only problem was that perhaps Howard should have brought some of his British influence to the menu at Tip Top and added a pie option. However, I didn't hold this against him too much as the food at Tip Top was exceptional. Head there while you can as it is sure to be taken over by beach resorts soon according to Howard. In summary, the pies weren’t great but don’t let this put you off a trip to Malaysian Borneo. There is so much to do and in a relatively small space. It is great for a short trip but there was plenty more I wanted to see and I would have loved to have spent longer there. Sadly we encountered no Gluten Free pies so Pierateer ALE was unable to join me in the pie rating experience. However, we didn't expect there to be any and we found that the locals were in general very understanding of her Coeliac disease and quite often spoke English.